Since 2013, the maximum duration of authorised stay is 90 days in any 180-day period. A traveller, who is not subject to the visa requirement, entered the Schengen territory for the 1st time on 1 January 2015 and left on 2 January 2015. Then s/he re-enters again on 1 June 2015 and would like to stay until 20 September 2015. On 15.6.2015: over the last 180 days (18.12.2014 – 15.06.2015) the traveller had stayed 2 days (01.01 15 to 02.01.15) plus 15 days (01.06.2015 to 15.6.2015) – calculated on that 15.06.2015, the maximum possible stay would have been until 29.08.2015. On 29.08.15: over the last 180 days (03.03.2015 – 29.08.2015) the traveller reached the 90 days (01.06.2015 to 29.08.2015). The traveller would not be able to re-enter the Schengen territory until the 28.11.2015. 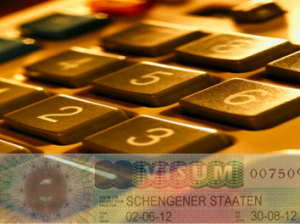 A third country/visa national issued with a multiple-entry Schengen visa valid for one year/12 months (01.01.2015 to 31.12.2015) allowing for a stay of 90 days per 180 days – The traveller in question enters the Schengen area on 01.01.2015 and leaves on 10.01.2015 (10 days), then re-enters on 01.03.2015 and leaves on 30.03.2015 (30 days) and enters again 01.05.2015 and leaves on 09.06.2015 (40 days). On 20.06.2015: the traveller might enter for a consecutive 20 days maximum (10 days leftover from the authorised 90 days (20-29.6), plus additional 10 days since on 30.06.2015 the stay on 01.01.2015 becomes irrelevant on 01.07.2015, the stay on 02.01.2015 becomes irrelevant…and so on . (will be outside the 180-day reference period). On 07.08.2015: the traveller can enter for a consecutive 20 days maximum as the 30-day stay starting on 01.03.2015 will only become irrelevant on 28.8.2015 (i.e. its corresponding 180-day reference period stars from 02.03.2015. It follows that the person should leave the Schengen area on the 26.08.2015, which is when s/he will reach the 90 days within the 180-day reference period. Fortunately an official calculator has been developed for the general public and for the Member States. Although it is subject to a caveat that its calculation cannot be relied on to determine one’s right to enter and stay, it remains a very useful tool for those who travel to the Schengen area extensively. complied/complies with the 90 days / 180-day rule.